Many NLM readers have long felt great admiration for the Benedictine monks of Norcia, who live the traditional monastic life according to the prescriptions of the Holy Rule, and who, it is now well known, brew some of the best beer in Italy. Among their earliest supporters were Joseph Cardinal Ratzinger, and since those days (ca. the Jubilee Year in 2000) the monastery has grown -- indeed, it has outgrown many of its rooms and buildings, necessitating various construction projects to expand facilities. This is good news in a monastery brimming with vocations! I have been blessed, as a friend and an oblate of the monastery, to watch their progress over the years, and now I am glad to be able to share with NLM readers some photographs of the refectory renovation. A brief history is in order: when the monks first arrived in Norcia, the diocese had prepared a kitchen the size of a bathroom and a dinning room for 8. The first request Fr Cassian Folsom (Prior) made was for a larger space for each. A kitchen to feed 20 was soon built and a suitable refectory prepared, but already after a few years the monks knew that this space also would be too small. (Monks, after all, are known for their hospitality, and there is no better way to show that than inviting a guest for a meal.) Two years ago, they settled on new plan to convert the existing refectory into a kitchen which could feed 100, and to convert an adjacent 15th-century vaulted hall into the permanent refectory. This ancient room, which had hitherto functioned as a chapel, chapter room, and music practice room at various points in its history, offered the right combination of character and functionality. On November 22nd, the new refectory was solemnly blessed, and participants in the project were treated to a meal there. On Thanksgiving day (yes, the monks do celebrate that -- one of only three times a year when meat is served in the monastery! ), Bishop Renato Boccardo of Spoleto-Norcia honored the monks with his first official visit to the newly renovated rooms, joining them even for the delightful American tradition of breaking the Wish Bone -- and I am told he won! While the monks expressed their thanks to the benefactors who made the project possible, it is thanks to God that such an awe-inspiring project could take form. If there's a "moral to the story," it would simply be that great sacred art can still be produced and is still being produced wherever the requisite skills are cultivated and the love of beauty is treasured. 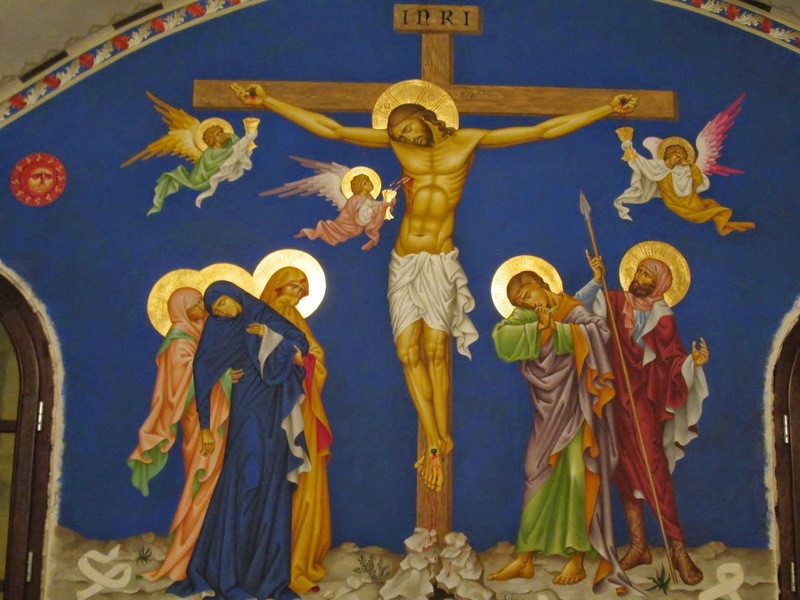 Allow me to stress that, while the main Crucifixion scene is completed and the ribs of the vaults have been decorated, the refectory and kitchen are still projects under way: there are plans to paint more sacred images on the walls, and there is culinary equipment left to purchase. The monks would benefit from any support you can offer them to complete the renovation. Please visit this site if you are interested in participating. And, no matter what, you can always get a 2015 Norcia Calendar!